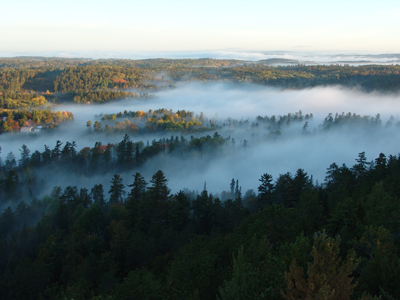 The beauty of the Temagami region has inspired and captured the imaginations of generations of native and European people, painters, photographers, poets, authors and naturalists alike. Te-MAWG-a-mee is Ojibway for “Deep Water by the Shore”. The Ojibway people played a large part in Temagami’s history. The popular White Bear Forest was named after a chief of the Teme Augama Anishnabai before Europeans arrived. The northern portion of the trails was developed by the White Bear family and other members of the Teme Augama Anishnabai. The trails were part of a portage system, estimated to be over 3000 years old, which passed through the heart of the forest from Snake Island Lake to Cassels Lake. Before the logging dam was built the water was lower than it is today, and it froze first so the First Nations people could portage their canoes along these routes. The village of Temagami began as a rest stop on the long portage from Snake Lake to Lake Temagami. Dan O’Connor, founder of Temagami, recognized the unique beauty and potential of the area and with great enthusiasm promoted tourism. Dan brought the lake’s first steamer through the bush from Lake Temiskaming in the winter of 1903 and went on to develop a steamship company. He also built the first hotel in Temagami, the Ronnoco. When the Temiskaming and Northern Ontario Railway (now Ontario Northland) came through Temagami in 1905 it opened up possibilities for tourism on a grand scale. The Ferguson Highway (now Highway 11) was completed between Temagami and North Bay in 1927. The Temagami Train Station, built in 1907 has lovely stone architecture. A project is currently underway to restore the building and keep it open to the public.